To change from cattle keeping to commercial cattle production would create an opportunity for minority ethnic smallholders in the Northwest of Vietnam to improve their income. This is due to the shortage of beef supply in the domestic market and import substitution industrialization which is the supporting environment for a country's domestic production to reduce its imports. Together, they create a dual-force encouraging domestic production to meet the domestic demand. However, behavioral changes of the minorities do not only depend on economic incentives but are strongly influenced by socio-cultural factors. The study aims to explain differences within the existing cattle production system based on social and cultural perspectives. Understanding these may help when proposing appropriate interventions for upgrading of the beef cattle value chain, subsequently fostering poverty reduction in the local area. One hundred and eighty six observations in two selected provinces were analyzed on the basis of ethnicity, geographical location and grazing-practices. 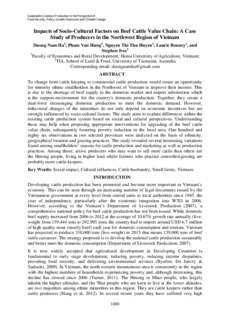 The study revealed several interesting variations found among smallholders’ reasons for cattle production and marketing as well as certain aspects of their production practices. Among those, active producers who may want to sell more cattle than others, are the Hmong people, living in higher land and whilst farmers who practice controlled-grazing are probably more cattle-keepers.